This week on the podcast we talk about the women who inspire us personally. We share the characters and moments that inspire us most and why we choose to draw inspiration from a whole range of different women, including the women we are lucky enough to interview on the podcast! 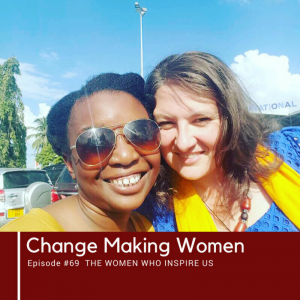 We also share about something new coming soon on the podcast which we are calling The Change Making Women Book Club. Each month we will be doing a show about a book written by a woman who has created change and talk about her story and why it inspires, motivates or challenges us. We will also be inviting listeners to get involved with this. Listen to this episode to find out more & follow us on Instagram where we will be sharing what our first book is going to be soon!